and reproducible quality also in case of greater lots. In order to ensure the quality the properties have to be verified, i.e. the parameters have to be measured and certified. This quality verification can be done in case of serial products by the measurement of a few representative parameters, as for example the "half value width" or "focal distance". The documentation is presented in the data sheets. 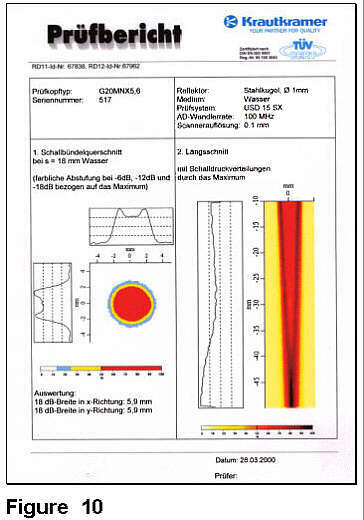 However, in case of special probes it is often necessary, to evaluate the interaction between the sound beam and reference reflectors, in order to determine the suitability for the special inspection task. For standard ultrasonic probes, which are manufactured serially, the European Standard EN 12668-2 describes the necessary parameters of the probes including the according measurement techniques and the permitted tolerances. The probe manufacturers have to present these parameters in the probe data sheet. By means of the manufacturer's certification according to EN 12668-2 it is ensured, that the probes have reproducible properties. However, the goal of this general probe standard is also to avoid additional verifications and certifications. As manifold as the inspection tasks are also the used special probes and thus the special properties of such probes. Some examples for the verification within this broad spectrum of probes for the manual and automated inspection are presented in this paper. A testing machine for new rails has to detect inhomogenities within the complete intersection of the rail. It is decisive that only small region may be uninspected. 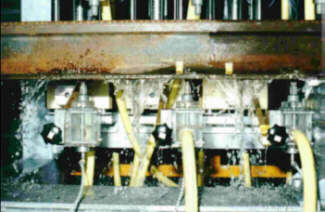 The ultrasonic coupling is done by water jetting, see figure 1 for the vertical inspection of a rail. 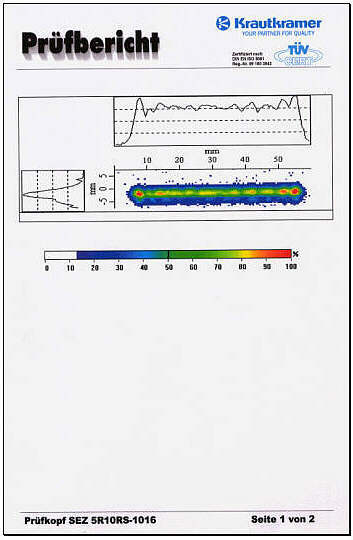 Because of the necessary covering of the volume several probes of the same type are applied and this requires the measurement and verification of the sound beam properties. Figure 2 represents an according probe certification for the probe type IAP6.12,7.130. 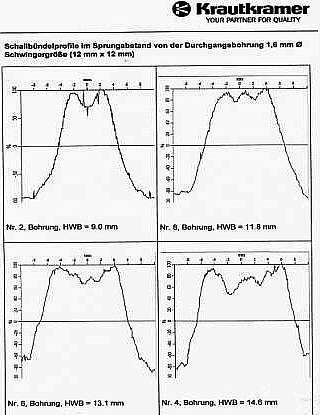 In this case it is required to determine the sound pressure curve versus the distance, the sound distribution in the vertical plane, as well as the sound distribution in the focal plane and the according pressure profiles perpendicular to the acoustical axis. 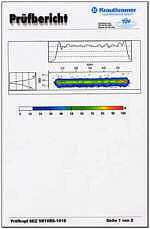 All these sound pressure distributions are presented in the probe inspection report. 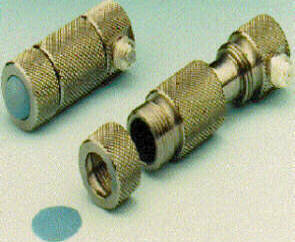 T/R-probes contain separated oscillators for the transmission and reception. For the steel plate inspection probes with a large transmitter and 3 small receiver oscillators are applied, e.g. the type SEZ5R10RS. 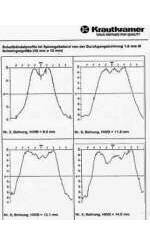 The sound beam properties are determined at a defined distance of the reference reflector. The figures 3 and 4 present some examples for the measured sound beam of the large transmitter and the form and position of the sound beams of the 3 small receivers. The selected colour coding covers a range of 18 dB. For this case it is important that the geometry of the sound beams are similar and that they cover the volume completely. 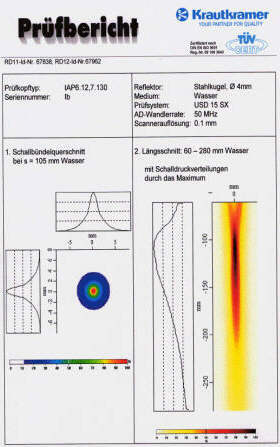 The detection of longitudinal defects in tubes means of "Rotation Inspection Systems" requires probes with a linefocussed sound beam. 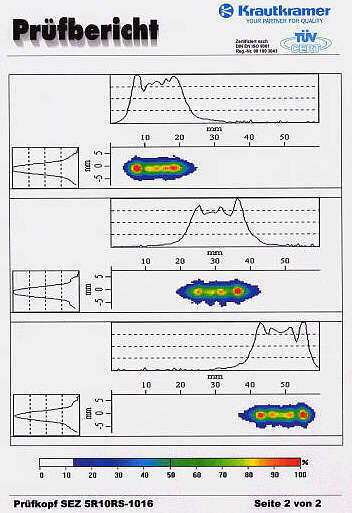 In order to achieve very high inspection speeds, several probes of the same type are used in parallel. Also here it is important to verify that the sound beams overlap in order to cover the volume without any gaps. To ensure this it is has to be certified that the sound pressure distance curves and the sound distributions parallel and perpendicular to the focus line are constant. 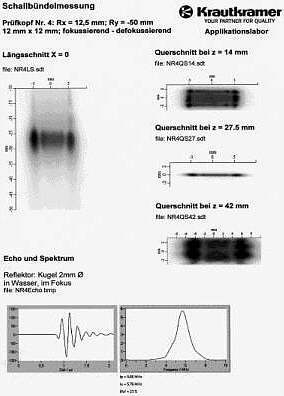 An example for the probe H5KTL30 given in figure 5. Figure 6 presents the grey value coded sound distribution in the longitudinal plane for such a defocussing transducer with a width of 12 mm · 12 mm with a bending radius of 50 mm. It also shows the according sound beam intersections in three different distances: Before the line focus, in the focus and behind it. The verification of the sound beam widening, which depends on the oscillator's bending radius, had to be done by using a side drilled hole with the diameter 1.6 mm in a tube wall with a thickness of 3.5 mm. The measured results are presented in figure 7 for four cases: for a plane line focussed oscillator and the defocussed oscillators with bending radii of 100 mm, 75 mm and 50 mm. It can be read out that the inspection zone concerning the side drilled hole reflection increases from 9,0 mm to 14,6 mm. Resistance welded spots are inspected by means of vertical probes with a special design for this inspection task, see figure 8. 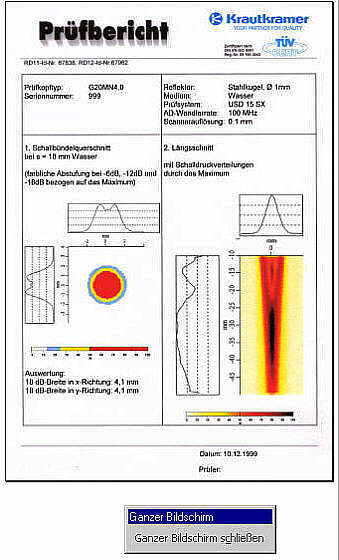 In order to detect too small spot weld nuggets it requires that the sound beam diameter is equal to the nominal nugget diameter in the region of interest. Therefore only those probes which are certified accordingly shall be used for the inspection of the spot welds e.g. in the the automobile industry. The figures 9 and 10 represent two certificates, one for the probe G20MN4,0 for a nominal nugget diameter of 4 mm and the other for the probe G20MN5,6 for a nugget of 5,6 mm. Additionally it also shows the axial sound pressure distribution. In case of standard probes a general technical probe data sheet and a confirmity declaration of the manufacturer according to the standard EN 12668-2 is enough. But special probe designs require individual verifications of the probe properties, which refer exactly to the special inspection task. These can be defined sound pressure distributions or defined sound beam diameters. 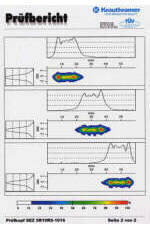 Sometimes also the interaction of the sound beam with predetermined reference reflectors must be verified. This requires scanning devices which exceed the measurement divices described in EN12668-2.